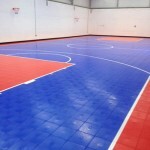 Home » Sports Floors & Surfaces	» Snapsports Sports Flooring in Co. Cork School. 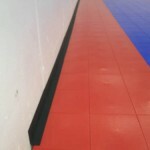 Snapsports Sports Flooring in Co. Cork School. 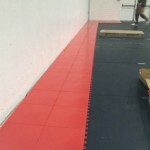 We have just completed our first Snapsports ‘Indoor Bounceback‘ sports floor installation in Ireland. We made our way down to Kilbrittain National School, Co. Cork early Monday morning. 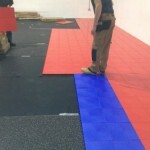 The full sportshall dimensions were 360 sqm, the school had requested contrasting vibrant colours; blue for the indoor basketball court and red for the run off areas. 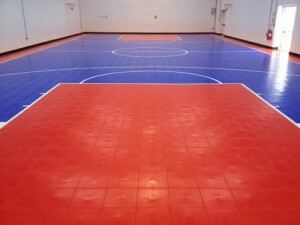 The court was line marked in white to complete the project. 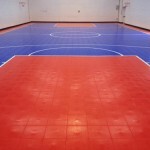 Our men completed the project in less than 3 days and the court will be ready to use just about now! organisations such as FIBA (basketball), USFF (Unites States Futsal Federation), Special Olympics and the ITF (International Tennis Federation). 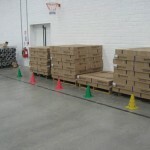 In addition, installation time (and cost) is kept to an absolute minimum because of the little preparation work required, most projects require only a matter of days to complete. If you require additional information or if you would like Fitness Functions to visit your sports hall and demonstrate the SnapSports product please do not hesitate to contact us. Email our digital marketing manager; niall@fitnessfunctions.ie. We look forward to your email. To view the full on-site photo gallery just see our Facebook Photos.